High-protein snacks help you stay full and more energized on even the busiest of days. Check out these 10 high-protein snacks perfect for on the go. For me, it’s important to have at least one high-protein snack during the day. It helps me to feel more energized instead of wanting to take a nap while feeling fuller so I don’t snack on a ton of sugar instead. Here are some of my favorite high-protein snacks, especially on those days you don’t really have time to stop and eat. Just keep in mind that nuts tend to be a higher calorie snack. They keep for a good amount of time in a cool, dark place. 2. Seeds – There are many tasty seeds out there. 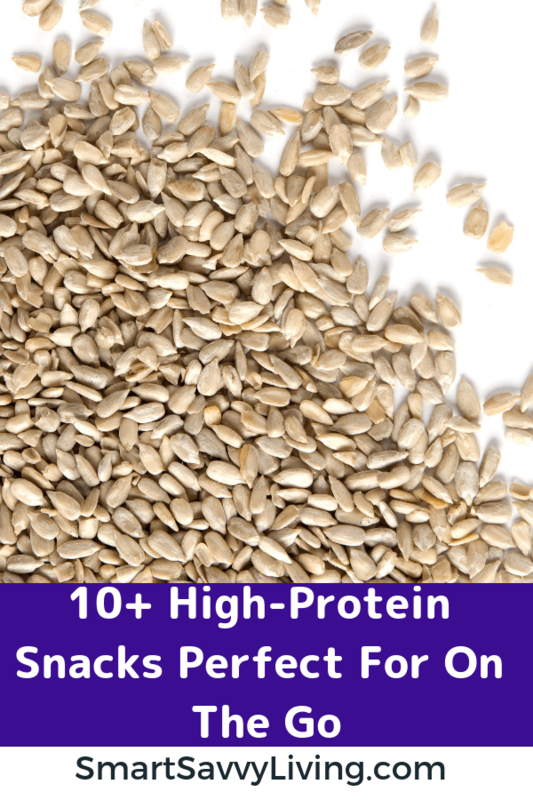 There’s about 7g of protein in 1/4 cup of dried/roasted pumpkin seeds and sesame seeds. Another favorite, sunflower seeds has about 8g of protein per 1/4 cup while chia seeds have about 12g. Seeds can easily be stirred into something like yogurt or kept in containers or zip-top bags for easy snacking. 3. Cheese – One ounce of cheddar cheese has about 7g of protein while mozzarella has about 8g. Cheese sticks or string cheese are especially great to take on the go. 4. Greek Yogurt – Greek yogurt is perfect if you like yogurt that is super thick and creamy with a kick of tart. While it has a good amount of protein in itself, you can pack it on even more with the addition of nuts, seeds, etc. 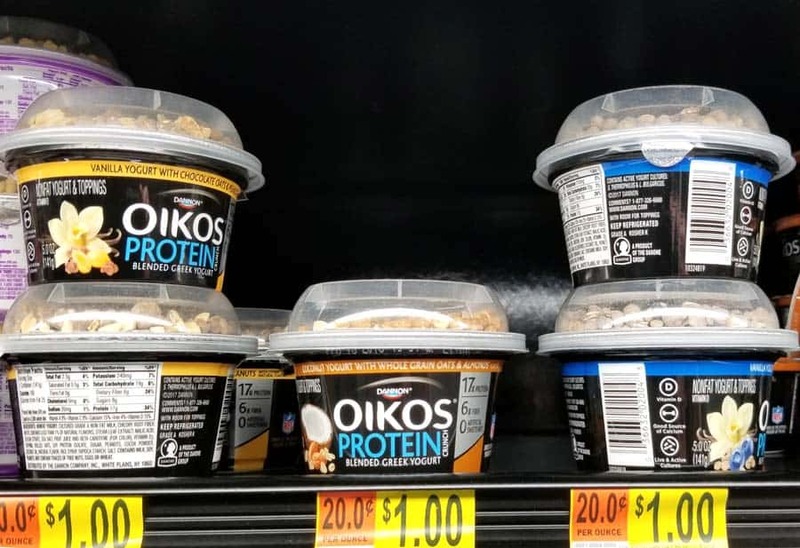 One of my favorite new yogurts happens to be Dannon Oikos Protein Crunch which you can find at Walmart. Even better, you can earn $.75 back when you purchase 2 with this Ibotta offer! 5. Tuna – A 3-ounce can of chunk light tuna in water contains around 16g of protein. It can easily be made into a tuna salad and eaten with crackers or lettuce leaves or added to a small salad. 6. Hard-Boiled Eggs – A large hard boiled egg contains about 6g of protein. Eat them by themselves with a bit of salt and pepper, turn into egg salad for a wrap or with crackers, or add to a small salad. 7. Peanut Or Nut Butters – Two tablespoons of chunky or smooth peanut butter has around 8g of protein, while 2 tablespoons of sunflower butter has around 6g of protein. Two tablespoons of almond butter has about 7 g of protein and cashew butter has about 6g of protein. 8. Jerkies – Jerkies are great to keep in your office drawer, car, or purse as they last a long time unopened. One ounce of beef jerky has around 9g of protein while pork jerky has about 11g of protein. 9. Cold Cut Wraps – One ounce of turkey cold cuts has about 4.2g of protein, with ham having about 4.75g and beef having 5.5g. Wrap them up with a slice of cheese for even more protein. 10. Hummus – 2 tablespoons of hummus has about 2.4g of protein and is great as a dip with things like carrots, pretzels, and crackers. 11. Pork Rinds – I have to admit that when I was a kid I thought it was beyond disgusting that my dad ate pork rinds. But now I LOVE them. They’re definitely one of my favorite snacks ever now. There’s 9g of protein in a half ounce of pork rinds with no carbs if that’s something important to you. What are some of your favorite high-protein snacks to eat on the go?